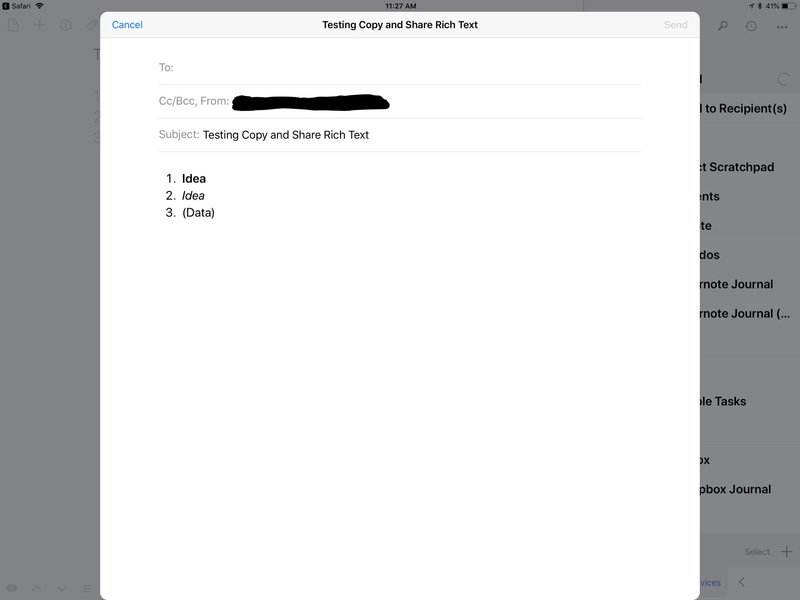 Action to convert drafts to rich text and then share with iOS share sheet? 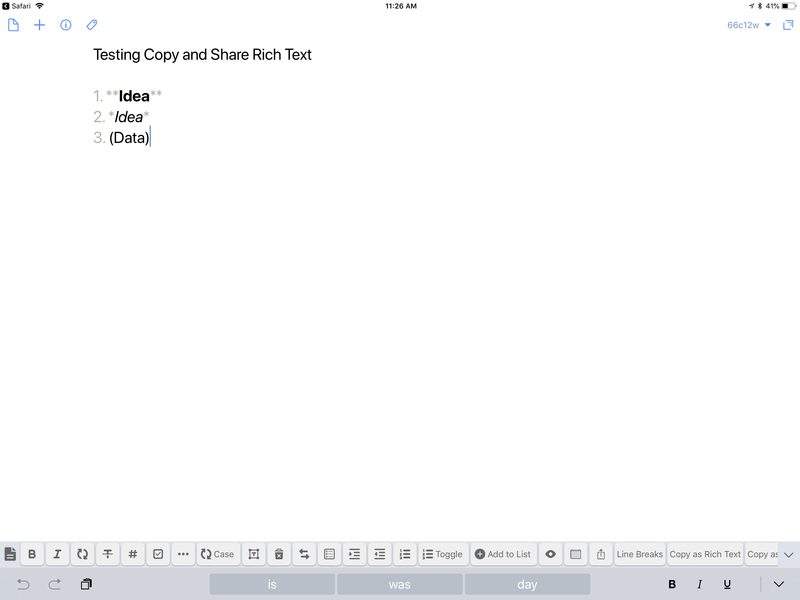 I find that if I use the “Copy as Rich task” action and then manually paste the text into an application, it looks line. See screenshot #2. What am I missing? I’m trying to take text and copy it to Microsoft Word. Any help is much appreciated. Thank you. Thanks for the tip. I tried it and it looks like it converts to html. Are you getting a different result or is the result different when you are sharing into Word? Thanks for the reply. Here are some screenshots. 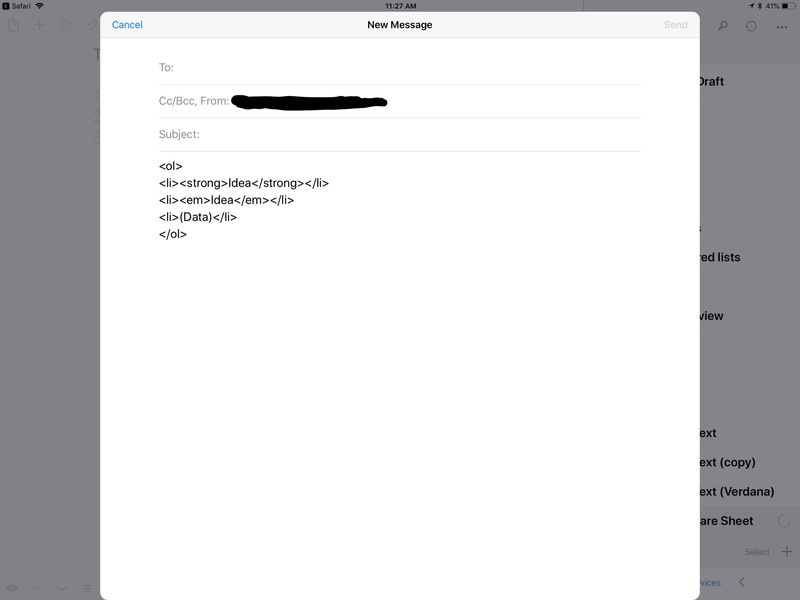 Not sure what is going and why I’m getting a different output using the Markdown Mail action compared to Rich Text to Share action. 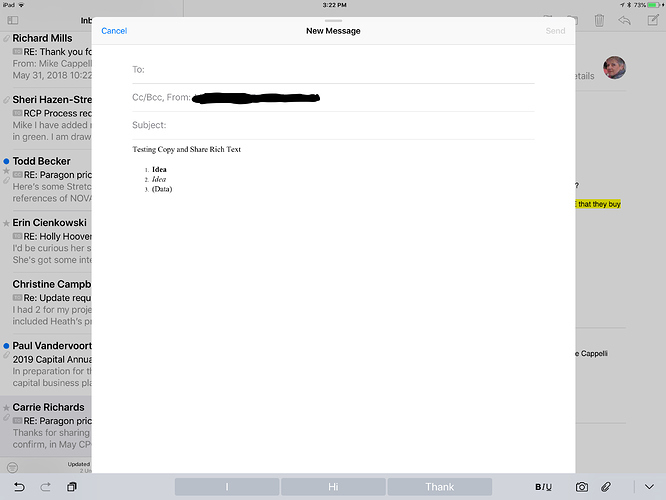 I now see a few settings in the Drafts 5 that relate to the Share Extension. Here are my settings. What are yours? I tried changing the settings from Markdown to Plain Text to Simple List and didn’t see any difference in output in ios Mail. I think the extension settings would only apply to content shared into Drafts and the template specifically from Safari as it states. I’m not sure of the reason (i.e. not looked into it yet), but it looks like the prefix stuff from my sample MMD content (authored by Fletcher penny) is affecting it in a positive way. Weird. I’m still seeing html type format. 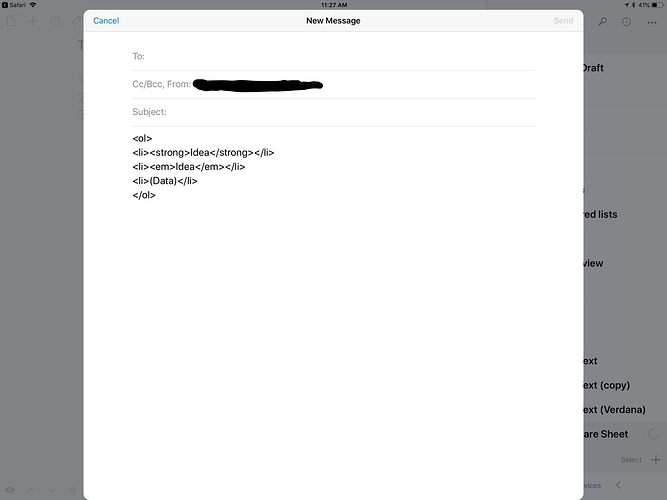 I have no issues with the Markdown email action. Or the copy as rich text action. Its just when I try to share with any application in the share sheet that Ihave issues. There’s no way to share as rich text. You have to use the clipboard. It’s been a while since I experimented, but last time I tried actually passing attributed text to share extensions it got ignored and converted to plain text by most share extensions anyway. Have there been any updates to this yet? I’m trying to a script that will convert markdown to rich text and pass to either Microsoft Word or Apple notes. 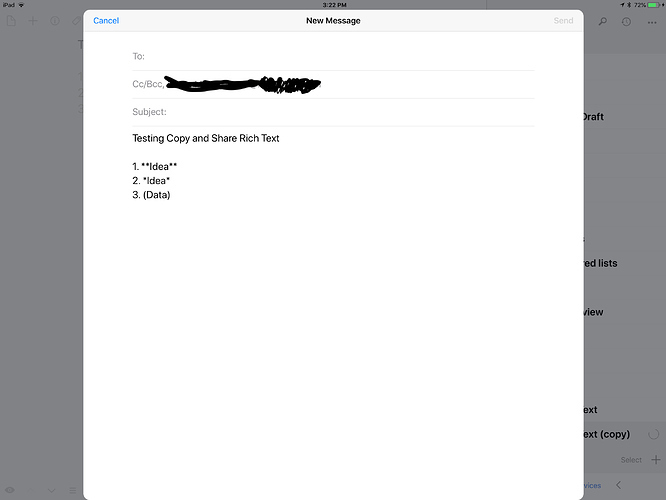 I can get it to work if I pass rich text to clipboard and then paste it into word but am looking for a more elegant solution. Any ideas? 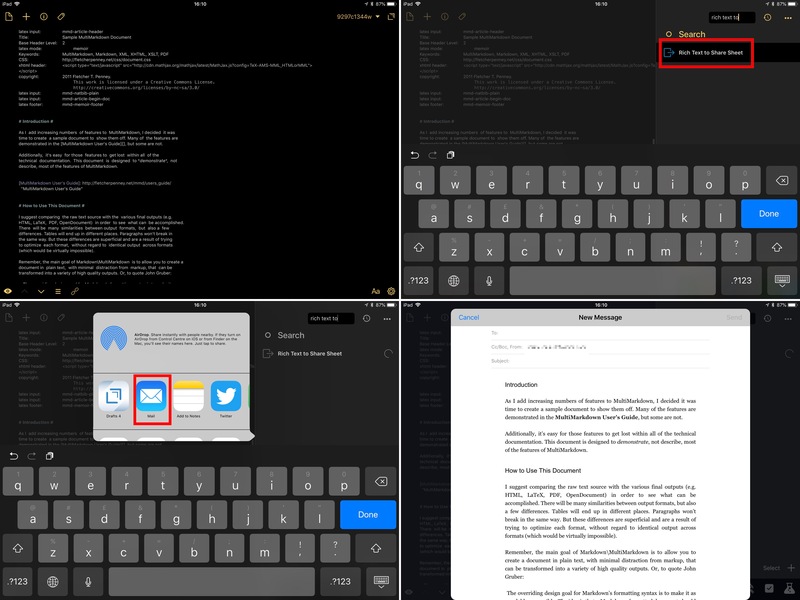 Could the shortcuts application help? 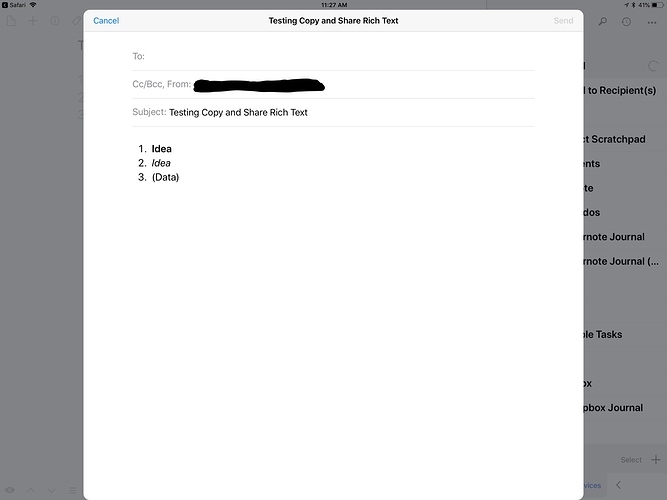 The issue is the functionality of the receiving app’s processing of content received via the share extension. You need to periodically try sharing or check release notes for those apps.